Aproximately 80 kilometers north of Beijing, near the most-visited part of the Great Wall, is the legendary Juyong Pass (居庸�P), Standing at the pass is theCrossing Street Tower(1). The Tower is also called “Cloud Platform,”as there once stood three white towers on top of it. 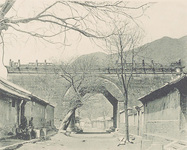 The three towers were destroyed in the transitional period between the Yuan Dynasty and the Ming Dynasty and today only the platform remains. The origin and history of the tower are written on the walls of both sides of the arched door of the platoform in six different scripts. Five of the six scripts were long ago identified as Sanskrit, Tibetan, Phags-pa, Uighur, and Chinese, but the last script remained a mystery. This mystery was finally solved in the 19th century when the French Orientalist Gabriel Devéria figured out that it was the Western Xia (Xi Xia, Hsi Hsia, 西夏) language. The Juyong Pass had been built in 1345―a date not all that long ago considering the long history of China―and so one wonders how it came to pass that this one language had been so completely forgotten? The Western Xia language was created by the Western Xia Dynasty (1032-1227), which ruled over the northwestern part of China (today’s Ningxia, Gansu, and Inner Mongolia Provinces). The empire was established by the Tanguts and thrived, like other nomadic empires, such as the Khitan and Jurchen Empires (Liao and Jin Dynasties), around the time of the Song Dynasty. It was later overthrown by the Mongols under Genghis Khan. During the period of the Yuan Dynasty, the histories of the Liao, the Jin and the Song were compiled as Three Historiographies of the Yuan Dynasty. However, the history of Western Xia Dynasty was not compiled, nor was the Western Xia language all but rarely recorded in documents. But the scriptcarved on the wall of central door of the platform is clear evidence that some people at least were still able to read and write the Western Xia language even 100 years after the dynasty had collapsed. As time went by, however, the number of people who understood the language declined, and finally no one was left who could recognize it any more. A major archeological discovery turned things around. In the early 20th century, the Russian explorer Pyotr Kuz'mich Kozlov found the ruins of Khara-Khoto, which literally means “black city” in Mongolian. Kozlov had come to Mongolia from Russia in 1907, intending to explore Mongolia and Sichuan. There local people informed him of a terrifying ruined city which was believed to be cursed and haunted. Intrigued by the story, Kozlov visited the ruins of Khara-Khoto located to the east of the lower reaches of the Edsin-Gol River （Photo(2), Map(3)). He discovered in the ruins Buddhist statues, Buddhist paintings, coins, and 30-odd books written in a mysterious language. Not knowing when and which people compiled the manuscripts, Kozlov sent his findings to the Russian Academy of Sciences. Later they were revealed to be important remains of the Western Xia Dynasty. On his way home from another site, he revisited the site in 1909, and collected a great number of Western Xia relics, including more than 2,000 documents and about 300 Buddhist paintings. Kozlov’s findings dramatically helped develop the study of the Xi Xia Dynasty as the documents found at Kara-Khoto revealed many unknowns facts about Western Xia society and its culture. Therefore, it was the excavations at Khara-Khoto--, Kozlov's greatest achievement-- which brought about the decisive turning point in Western Xia studies.